At Belle Isle I checked in with Tootsie Feinschriber, the new owner, a hugely successful author of romance novels and a dedicated patron of the arts. Bronco, I learned, would be arriving any day now. It had been pretty grubby on the bus, but I was feeling optimistic because I knew it would be first cabin from here on out. Writer in residence! I was excited. Getting dumped by Diamanta had pretty much taken the wind out of my sails, and this Belle Isle deal, I figured, was exactly the boost I needed to get me back up and running. There had been some changes since my first visit to Belle Isle, I discovered. The slave dwellings had been completely refurbished on the inside, each with a bathroom, kitchenette and air conditioning, to house artist colony residents and also the tourists who would be flocking to Belle Isle to watch Bronco work on his colossal welded steel and cast bronze Gigantopithecus. On the day I arrived Tootsie Feinschriber held a little soiree on the verandah so I could meet the other inmates. We were two writers, a painter named Kristof, a surly Polish sculptor, Stasic or Stasig—no English—and an interpretive dancer, Alessandra, a big leggy girl with brown bangs and big square teeth, a real centauress. My slave cabin was next door to hers. My new home was very comfortable, I’ll say that. But sometimes at night when I was asleep I had the eerie feeling that my shack was meandering around the property—particularly in Alessandra’s direction—like Baba Yaga’s magical hut mounted on chicken legs. And there were ghosts… The ghost of Jean Lafitte, for example, and the ghost of Mathilda, the Creole slave girl whose portrait hung on the wall of Tootsie Feinschriber’s bedroom. Valentin, the other writer, was a Yale graduate and a certified black belt schizophrenic. He was on the dole. You have to be bright to be crazy and Valentin was both. Trading on his charm and erudition, he attached himself to Tootsie Feinschriber eons ago. All this I learned from Alessandra. We’d have our little confabs near Bronco’s half finished concrete boat in the Peach Orchard. Valentin had subsisted for decades in a parasitic manner, Alessandra informed me, a tumor clinging to the wall of Tootsie Feinschriber’s uterus. He was a cockroach, Valentin, a literate insect. Where Tootsie was all sparkle, charisma and pizzazz, Valentin was passive, analytical, phlegmatic. As far as anyone knew, the man had never held a job. Alessandra did say that he’d once published a philosophical treatise on the importance of being indigent. There was something almost reptilian about Valentin. He dressed like a European hoodlum. Nearly every day you’d see him reclining on a meditation bench in the sun near the Manneken Pis fountain, his eyes covered by black plastic eyecups. His boyish white body glistened with baby oil, and his maroon Speedo trunks left little to the imagination. From time to time he’d nervously run a hand through his flowing mane of silvery gray hair. Always at his side was a dog-eared copy of Being and Nothingness. The artist today, Valentin was fond of asserting, has completely outlived his usefulness. The world, he insisted, no longer needs artists, poets, seers. The world needs people who are not afraid to spill blood. He was dead right, of course, but what you have to understand is that Valentin was forever talking about the plight of the artist. Valentin thought he was an artist, but he wasn’t. He was an intellectual. What Valentin needed in order to transform him into an artist was fifteen or sixteen years in a steel mill. The day after I finished the repairs on the Manneken Pis fountain, Kristof—dapper in his bullfighter’s beret, tweed sport jacket and smock—emerged, brush in hand, from his cabin on the other side of Alessandra’s hut. He stood on his doorstep, gazing meditatively at the gurgling fountain. Kristof had sprezzatura, no question about it. And Tootsie Feinshriber, sure, she had it. And Bronco, of course, Bronco was absolutely loaded with it, Bronco was crawling with sprezzatura. I knew I should have been working on my screenplay, but instead an immense lethargy consumed me. It was, of course, a touch of post-traumatic stress syndrome in the wake of Diamanta’s abrupt dismissal. She’d played Donkey Kong with my affections, no question about it. This intense torpor was a continuation and escalation of the ennui that had possessed me earlier in the white picket fence world of Sonrisa Street, but now the friendly jingle of the ice cream vendor’s hopeful pushcart had given way to a menacing chorus of fever cannons and Congo tom toms booming deep in the heart of darkness. There was no escaping it, this lethargy, no avoiding it. The muggy, mosquito-infested heat of Belle Isle was a presence that bludgeoned me with a padded hammer. Brownish rain drizzled down from a sluggish sky, warm as baby drool and fragrant with honeysuckle nectar, tucking me in, rocking me to sleep, filling my ears with a deadening lullaby. The air was still, and as anvil storm clouds turgid with black water shoved the overarching live oaks down into the prehistoric ooze of the swamp, I felt myself sinking with them into a black pool of weariness. I slept and slept, for hours, days, while fever images chased each other in my brain, waking up only to answer the call of nature, after which I’d tramp out to the edge of the bayou where I’d sit on a rotting log and peer into a shadow-world where light and darkness flirted like fireflies and nothing was distinguishable, neither land nor water, everything intermingled, a pancake world of mosquitoes and catcalls and mirage. Bronco was a prince, I have to say that. He took me to Clancy’s in New Orleans for soft shelled crabs, and then to the French Quarter jazz clubs, and finally to the strip joints—Big Daddy’s, Bourbon Street Burlesque and the Can Can Cabaret. It was intoxicating, sure, going to the places with a celebrity, with a guy who was Mr. Sprezzatura himself, but even the red carpet treatment, the sparkling meals and the naked pole-dancing girls couldn’t rouse me from my torpor. All I could see when I closed my eyes was a black sun rising in a sea of blood. The world—a basketful of lecherous crabs—what did I want with it? A few days later Bronco introduced me to film director Sergey Billetnikov, who optioned my screenplay for three hundred bucks after merely glancing at it. We had a little confab out in the Peach Orchard near Bronco’s half finished concrete boat. “No, just friends,” I managed. “Yeah…sure…yeah.” I was weary, bleary, only half there. Every word was an effort, but I knew I had to pretend an interest. After all, this was my big break. I gathered all my strength. I was curious about Mathilda, and so was Alessandra. We conjectured that Mathilda's mother or grandmother had been brought to Louisiana from Senegambia, the West African slave trading center, and that Mathilda, fathered by a French plantation owner, had been born into slavery and probably spoke a patois similar to the patois spoken by Baptiste, our present day chef at Belle Isle Plantation, when he talked with Andre the dishwasher and Philippe the prep cook. One day the two of us were rummaging around in the attic and Alessandra discovered an old trunk filled with receipts, recipes and lists, including a Belle Isle Plantation April 1848 Inventory, which appraised Mathilda, “Creole Negress, age 19,” at $1,200. 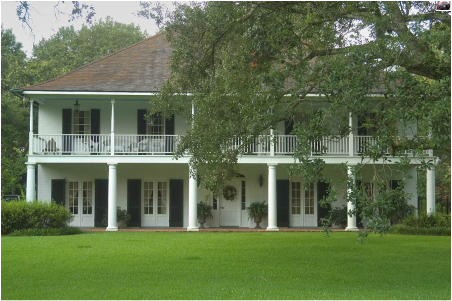 Mathilda must have been highly regarded because elsewhere in the Inventory it showed that the Belle Isle Plantation owner had purchased several slaves from nearby Chandler Oaks Plantation, a mother, a father and two children—a whole family—for just a under a grand. A few days later we found Mathilda’s grave, out in the Peach Orchard near Bronco’s concrete boat. We picked some roses from the garden and placed them by her headstone, and somehow that made me feel better. It was as if I were putting roses on Diamanta’s grave. I was starting to come back to life. Now that Bronco had returned to Belle Isle busloads of tourists with designer jeans and expensive cameras began arriving daily and all the slave cabins were full. Kristof had a show coming up in the Big Easy, the Polish sculptor had been deported and Tootsie Feinschriber had flown to New York to shlep her latest blockbuster. My screenplay was in tatters, thanks to the mad Russian, Sergey Billetnikov. I wanted to put Mathilda in the screenplay but Billetnikov wouldn’t hear of it. I started hanging out with Baptiste, the cook. He was a regular guy. We understood each other. We were cut from the same cloth: dishwashers, taxi drivers, machine gunners, we’re the guys who sweep the floors, flip the burgers and fight the wars on the ground. The truth is I would have been more comfortable working in the kitchen at Belle Isle than playing at being a writer in residence. Baptiste had a pirogue and we’d tool around the bayous. It was peaceful out there and the sky’s reflection etched on the limpid black water was so clear we seemed to be floating on top of the clouds. The bayou was teeming with wild creatures—alligators, snakes and birds. You rarely saw them but you knew that they were out there, slithering, creeping, stalking. They were busy catching and devouring one another. A slaughterhouse, yes, but it was slaughter waged in the name of hunger rather than on behalf of politics and religion, and there was something honest and refreshing about that. And every so often, just to keep things interesting, the ghost of Jean Lafitte would send a phantom cannon ball scudding across our bow. Then there was the matter of Alessandra, the interpretive dancer. Baptiste had a crush on Alessandra. But who didn’t? Of course we never had a chance, not me, and certainly not Baptiste. I mean, he wasn’t much to look at, Baptiste. A couple of missing teeth in front, a blue stubble beard, a raffish glint in his eye. Baptiste was a bull that you hit between the eyes with a hammer. He was stunned, mesmerized, drunk with the terror and wonder of Alessandra. Some nights we'd sit on the verandah with beers and watch her dancing in the Peach Orchard, dancing on Mathilda's grave, dancing in the sky. She'd peek over the horizon and wink at us, her huge moon-face lighting up the world as she ascended to the heavens. Alessandra wasn’t a woman; she was a constellation. And when dawn sent Venus and the Pleiades scampering for cover we’d watch her vanish into the west, riding the ecliptic, moving with the fixed stars. We went to see a hoodoo lady named Madame Yvonne who lived in a shanty that crouched warily behind long silver-gray beards of Spanish moss. Baptiste thought maybe she could help him. She was supposed to be an expert at casting love charms. We had to travel by pirogue. Her shack was deep, deep in the bayou. The two of them talked the Creole patois. I didn’t know what they were saying, but Baptiste spelled it all out for me on the way back to Belle Isle. For Baptiste Madame Yvonne filled a hollowed out apple with honey and the name “Alessandra” scrawled on a slip of paper, then sealed the apple up in a tin can and burned a candle on top of it. She also gave Baptiste a mojo bag filled with herbs and alligator teeth. None of it worked. On our next visit Madame Yvonne prescribed a graveyard-dirt love spell, so we brought her some dirt from Mathilda’s grave, and also, at Madame Yvonne’s request, some dirt from one of Alessandra’s footprints. Madame Yvonne filled a clay pot with Alessandra’s footprint dirt and buried a rose quartz crystal, then planted marigolds in the pot and she made Baptiste eat some of the marigold blossoms. She wanted Baptiste to bring her a single hair from Alessandra’s chatte, too. Now how the hell was he supposed to get that, can you tell me? Things happened quickly after that. Bronco finished his concrete boat and sailed for Belize, a cellist from Minneapolis took over my cabin, Alessandra moved in with Valentin and Sergey Billetnikov tore up my option. On the day before Bronco sailed I dropped by his studio to say goodbye. Bronco was putting the finishing touches on his terrifying life-size steel Gigantopithecus. He remarked that I was looking better, and we chatted for a while, then he showed me how to use a rebar bender. There’s something very real and truly honest about a rebar bender. A person can believe in a rebar bender.